Most of these are house tours which also feature gardens, some are garden-only tours. As part of Bike Month NYC, join GreenThumb Community Gardeners for a bike tour starting in East New York, part of NYC's densest concentration of community gardens. Learn about the tumultuous history of gardening in NYC and see the fruits of the gardens. 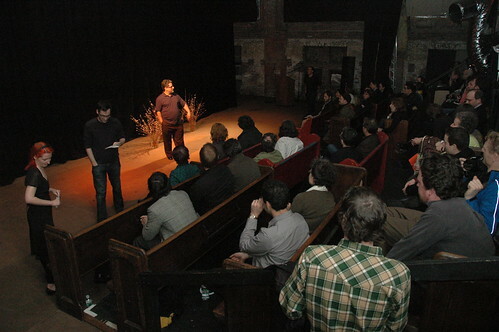 Sunday, May 17, 2009, 9:30 a.m.–1:00 p.m.
Tickets, $20, at the Forest Floor, 659 Vanderbilt Avenue (Prospect Place) in Prospect Heights; Greene Grape Provisions, 753 Fulton Street (South Portland Avenue) in Fort Greene; and Root Stock and Quade, 471 Myrtle Avenue (Washington Street) in Clinton Hill. Advance tickets, $15, and information: (718) 858-7968, e-mail to brownstonebgd@gmail.com or bbgd.wordpress.com. Mertensia virginica, Virginia Bluebells blooming yesterday afternoon in the Native Flora Garden at the Brooklyn Botanic Garden. 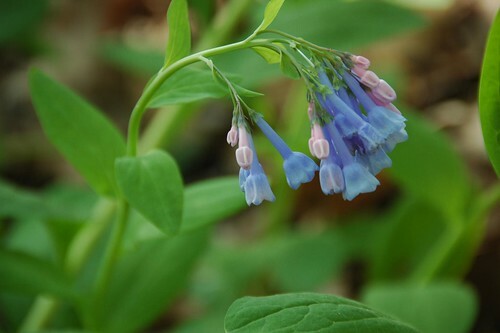 The 2nd annual NYC Wildflower Week celebrates all things green and wild in the Big Apple—the hundreds of native flowers, trees, shrubs and grasses that are found in the five boroughs. It gives New Yorkers numerous ways to connect with and be inspired by their local environment. Free activities throughout the city include: botanical walks, garden tours, ecology lectures, children’s events, planting opportunities, cooking classes, and food tastings at top restaurants. It is the largest celebration of National Wildflower Week, an initiative begun by Lady Bird Johnson. Events are two numerous to list here. Please see the WFW calendar for a complete listing of and details on all events. They cover all five boroughs. See below for events in Brooklyn, which are also listed in the Flatbush Gardener calendar in the sidebar. 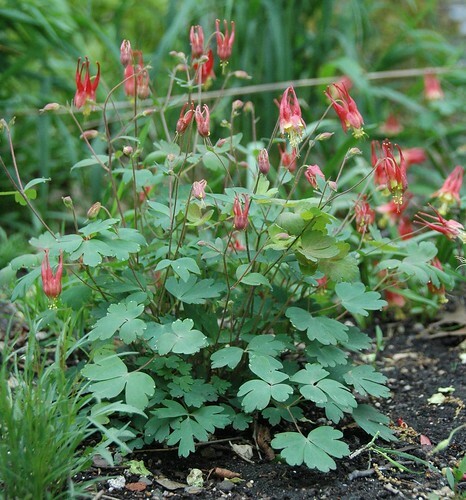 Aquilegia canadensis, Eastern Columbine blooming in the Union Square Native Plant Garden in May 2008. For more information, call 311 and ask for the Brooklyn Urban Park Rangers. 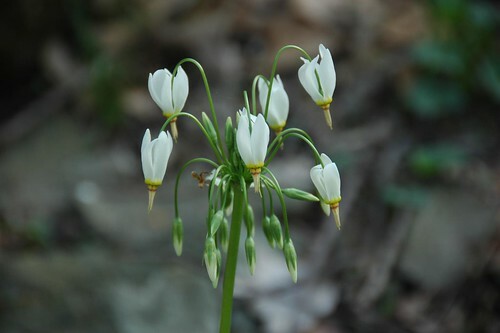 Description: Join the Urban Park Rangers for a hike through the salt marsh and learn about New York City’s beautiful native flora that flourish in the wetlands of Brooklyn. Dress for the weather, bring comfortable walking shoes and water, hat. You may also like to have a camera, hand lens, field guides, water, bug spray. Description: Tour recent restorations in the woodlands and along the waterways in Prospect Park. The walk will focus on native plantings as well as invasive plant problems. Dodecathon meadia, Eastern Shooting-Star, yesterday afternoon, Native Flora Garden, Brooklyn Botanic Garden. 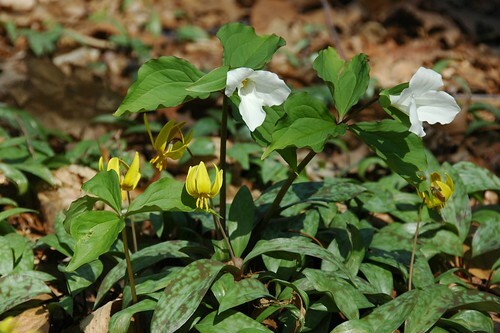 Description: Highlights will include many spring ephemerals such as trillium species (Trillium spp. ), mayapple (Podophyllum peltatum) and violets (Viola spp.). Native azaleas will also be in bloom including the flame, pinxterbloom and sweet azaleas (Rhododendron spp.). A multitude of fern species will be emerging as well as aquatics such as golden club (Orontium aquaticum) and blue flag iris (Iris versicolor). Lilium canadense, Canada Lily, July 2006, Native Flora Garden, Brooklyn Botanic Garden. Description: This program is presented by the Brooklyn Bridge Park Conservancy with guest speaker and native plant specialist Sara Stopek. 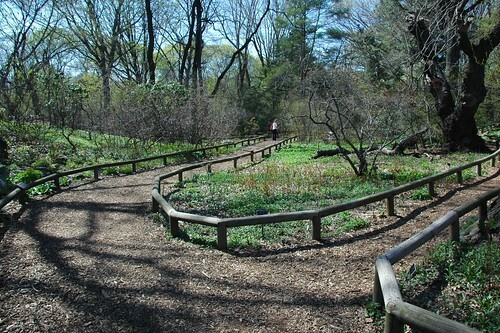 It features a guided tour of native plants and wildflowers in Brooklyn Bridge Park. The tour is followed by a native wildflower planting project by students from Science Skills High School. 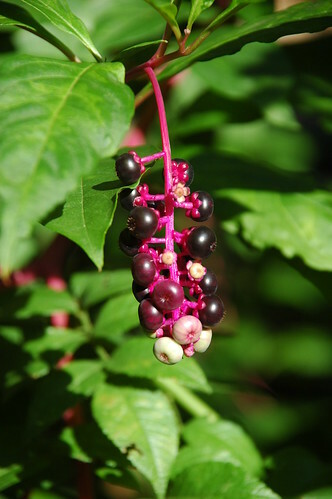 Berries of Phytolacca americana, Pokeweed, in my backyard native plant garden in Flatbush, Brooklyn, in October 2007. Last Friday, I had the opportunity to visit the Brooklyn Botanic Garden. The Native Flora Garden was how I hoped it would be. Some of my favorite native woodland wildflowers were in bloom. That was before our weekend heat wave and record high temperatures. Starting this week, I'll be returning on Tuesday afternoons, when I take my Soil Management course toward my Certificate in Horticulture at BBG. 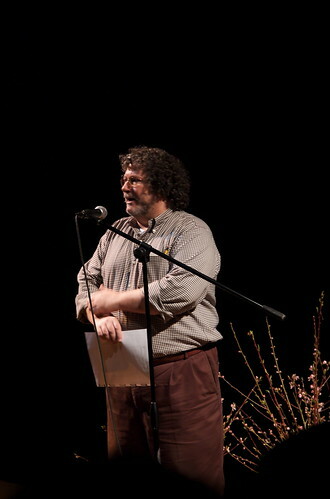 The instructor is Uli Lorimer, who is also the curator of the Native Flora Garden. The view just inside the southern entrance to the garden. There is a large drift of Viola sororia forma priceana, Confederate Violet, just inside the southern entrance to this garden. 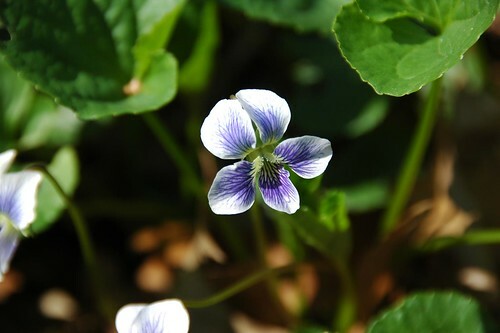 I would not mind this growing as a "weed" in my garden in place of the common purple violets I'm constantly digging out. 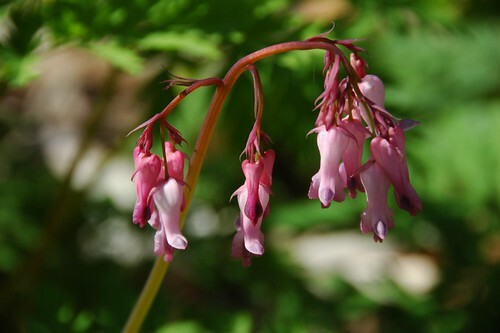 Dicentra eximia, Eastern Bleeding-Heart, grows inside and outside the entrance, and throughout the garden. I have a white-flowering form in my backyard garden which is just starting to bloom. 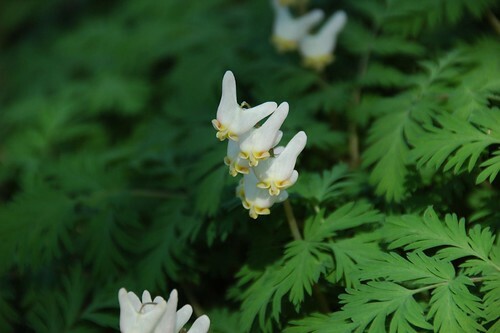 D. cucullaria, Dutchman's Breeches, blooms nearby with similar wands of dangling flowers and lovely ferny foliage. 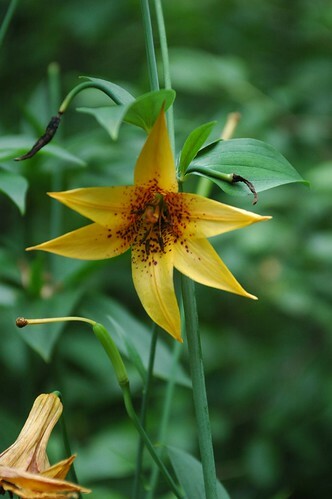 Erythronium americanum, Trout-Lily (yellow) and Trillium grandiflorum (white). 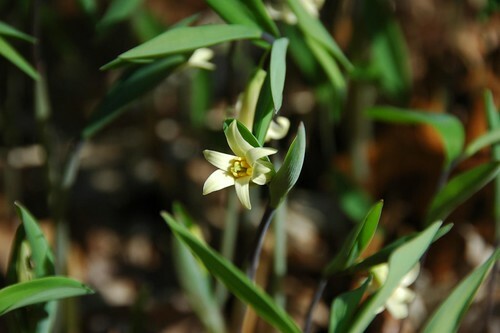 When I visited, the Trout-Lily were blooming in fields of thousands all over the Native Flora Garden. 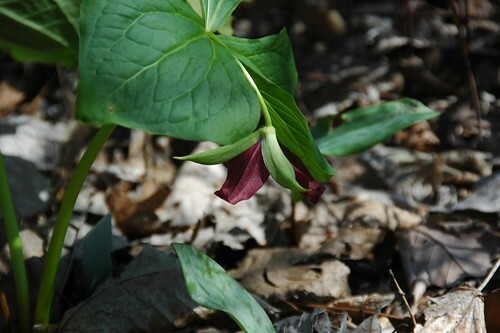 T. erectum, Purple Trillium, was bashful despite its specific epithet. From repeated visits, I'm coming to appreciate the subtle charms of Uvularia sessilifolia, Wild Oats. This is one of the few upright flowers I found, just emerging from the bud; as the flowers mature, the peduncle extends, and the flowers dangle below like narrow bells. 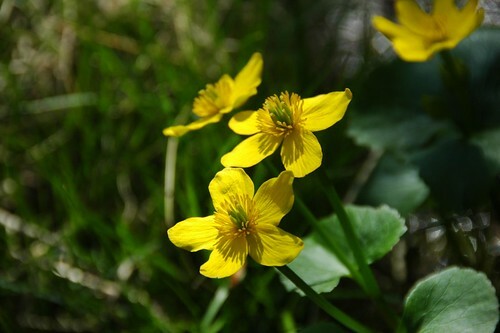 Caltha palustris, Marsh Marigold, growing in the Bog habitat. 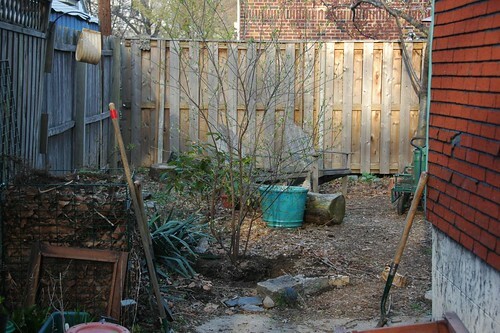 I helped plant this Zelkova serrata, Japanese Zelkova, last year. 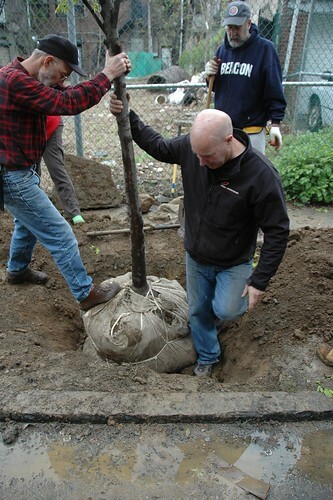 Part of the Arbor Day weekend activities in Flatbush, on Sunday you can help plant 9 trees in Ditmas Park West, one of the neighborhoods of Victorian Flatbush. Meet at 10am at 458 Rugby Road [GMAP]. Bring your own tools and gloves, if you have them. Wear sturdy work boots, and prepare to get dirty! No rain is predicated through the weekend, so you won't have to deal with last year's mud. Possibly record highs - temperatures in the upper 80s - are predicted for Sunday, so wear your sunscreen and bring lots of water to stay hydrated. At the meeting place, they will form work crews which will fan out to different locations. Some will plant trees, some will do cleanups. At 1pm, folks meet up for lunch. I remember when we first received images of the earth from space. 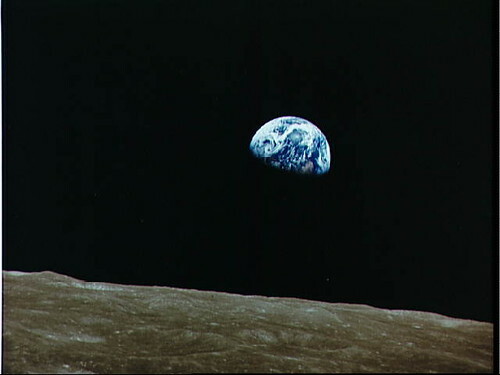 This image, taken by Apollo VIII astronauts returning to Earth after circumnavigating the moon, was not the first. But, showing the green, wet, full-of-life, and finite Earth in stark contrast to the dry, lifeless Moon, it helped energize the environmental movement. 2009.04.23 IMPORTANT TRANSIT SERVICE ADVISORY: The Manhattan-bound Q train will only stop at Church Avenue between Kings Highway and Prospect Park this weekend. Coney Island bound trains will make all stops. 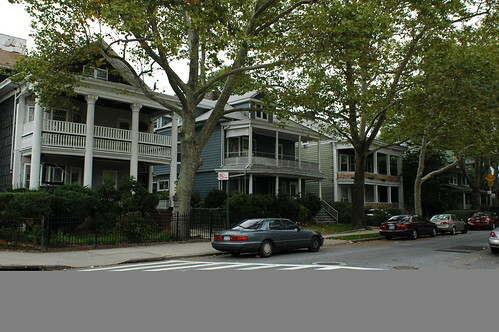 Argyle Road in my neighborhood of Beverley Square West in Flatbush, Brooklyn, one of the blocks that will be on Saturday's tour. This Saturday, April 25, join Sustainable Flatbush in our second year of celebrating Arbor Day and the magnificent street trees of Brooklyn's Victorian Flatbush. 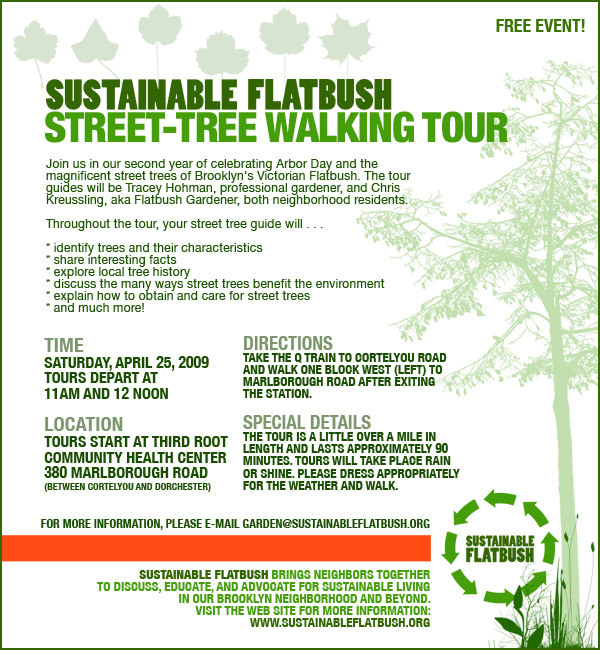 The Sustainable Flatbush Arbor Day 2009 Street Tree Walking Tour reprises last year's route, visiting the Victorian Flatbush neighborhoods of Beverley Square West and Prospect Park South. Tours will depart at 11am and 12noon from Third Root Community Health Center at 380 Marlborough Road, just south of Cortelyou Road. [GMAP] Take the Q train to Cortelyou Road and walk one block west (left) to Marlborough Road after exiting the station. This FREE tour is a little over a mile in length and lasts approximately 90 minutes. Tours will take place rain or shine. Please gear appropriately for the weather and walk: sunscreen, comfortable walking shoes, water, and so on. For more information about the tour, please email garden AT sustainableflatbush DOT org. 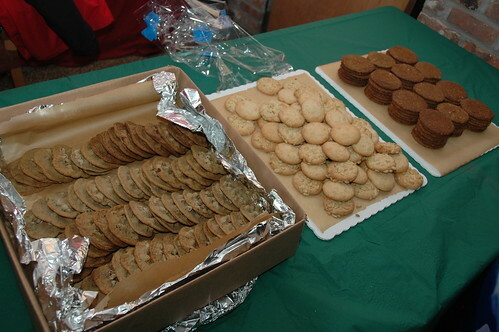 Sustainable Flatbush brings neighbors together to discuss, educate, and advocate for sustainable living in our Brooklyn neighborhood and beyond. Very handsome, but not what I thought I had acquired. This individual was supposed to be V. dentatum 'Christom' (Blue Muffin®), a dwarf cultivar reaching 4-5 feet in height and 3-4 feet in breadth. (The species is highly variable, height can range from 3 feet up to a maximum of 15 feet.) It's now over 6-1/2 feet high and has extended across the narrow concrete path at its feet. So I can be forgiven some poor planning on my part that the plant has far exceeded its expected bounds. I needed to move it from this location because it was blocking the path. However, in this location it was doing an excellent job of screening some "necessaries": cans and bins for garbage, recycling, and composting. 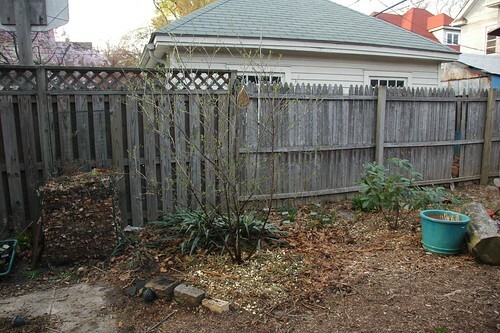 And that suggested I could solve two problems at once by transplanting it to the backyard to screen the gardener's nook from the street. Folks walking by on the sidewalk get a straight view into this corner of the backyard. I want this to be an intimate, sheltered location. 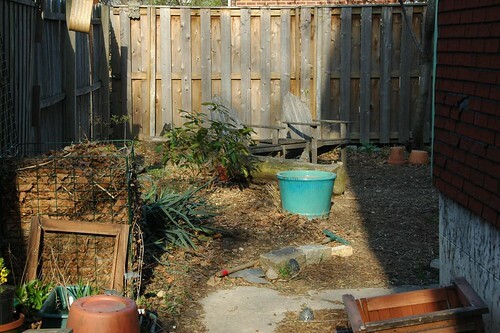 When I did the garden design for my backyard, I doubled the depth of the bed along the north edge of the property, visible on the left of the photo above and the plan below. Earlier this season, I executed that part of the plan. 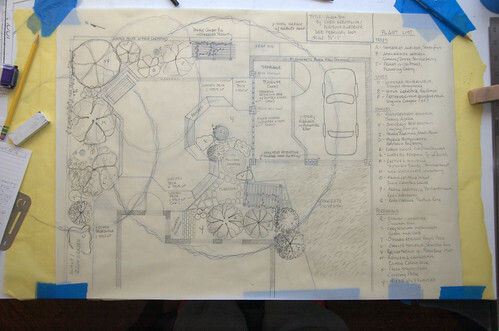 On the right, the gardener's nook is located where the deck will extend to accommodate a bench, as shown on the upper left of the plan above. 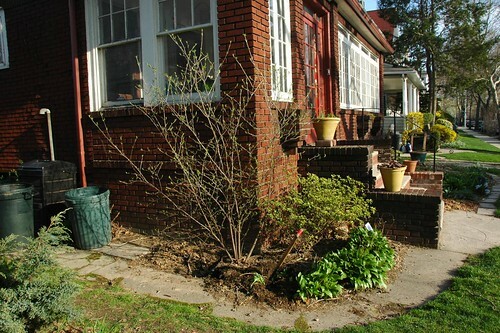 I transplanted the Viburnum to roughly the location indicated by the shrub marked "L" in the plan. I had specified Lindera benzoin, which I don't have, for that location, but the Arrowwood should do as well there. You can see that it does a great job of screening the view, even though it hasn't fully leafed out yet. During the summer, the nook will now be completely shielded from the street. It also dramatically changes the character of the space. 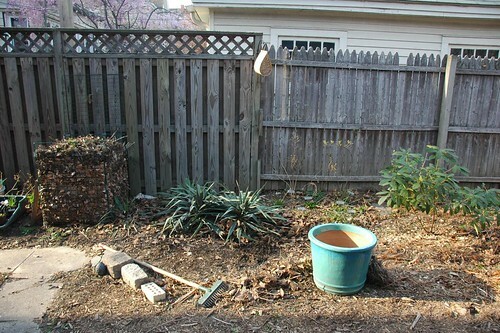 Compare these before and after shots. 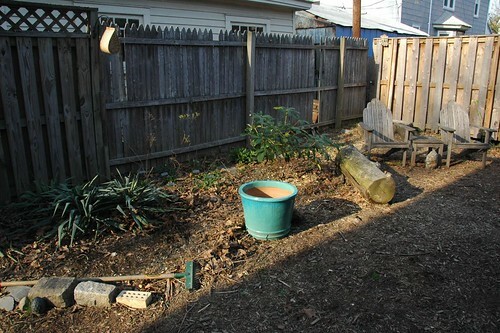 The backyard now has a sense of enclosure it didn't have before, even within the parts of the backyard that are not visible from the street. This validates a key strategy of the design: enclosing the space with shrubs to create the feeling of being in a woodland garden. The Health Department found an elevated lead level in the crumb rubber infill material at Thomas Jefferson Park in Manhattan in 2008. ... 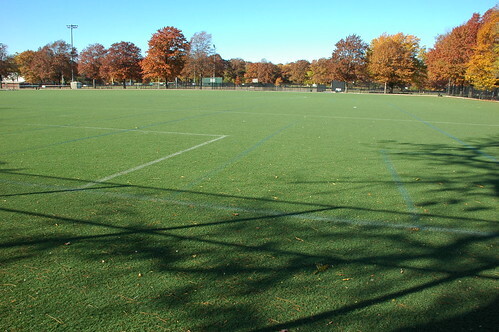 Using protocols developed by the Health Department, an accredited lab working for the Parks Department has since tested the remaining synthetic turf installations throughout New York City for lead and has not found a lead hazard at any other fields. Aside from Thomas Jefferson Park, the test results for the remaining 102 fields and play areas were below the acceptable EPA lead level for soil (400 parts per million [ppm]), the best standard available, and no potential lead hazards were found. Lead levels for the 102 fields ranged from ‘not detected’ to 240 ppm and 96% of the results were less than 100 ppm. The highest level of the new study, 240 ppm, was found in J.J. Walker Park in Greenwich Village in Manhattan. The second highest, 154 ppm, was found at Parade Ground Field 9, just south of Prospect Park in Flatbush, Brooklyn. This is the video that opened the Memorial on Saturday. If you didn't know Bob, or you're one of my distant gardener-readers who by now must be wondering why I've written so much about him the past few weeks, please watch this.